Assimilated counterpart who spoke to the Empire in a parallel universe. 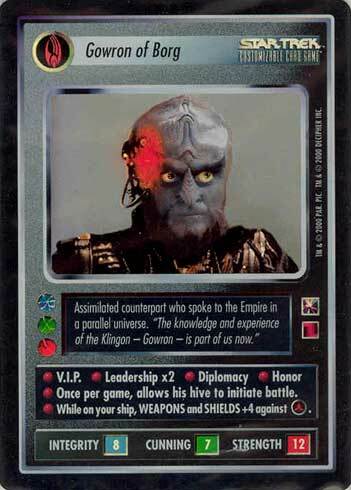 "The knowledge and experience of the Klingon - Gowron - is part of us now." • V.I.P. • Leadership x2 • Diplomacy • Honor • Once per game, allows his hive to initiate battle. • While on your ship, WEAPONS and SHIELDS +4 against .